It took to OVFF 18 in October, 2002 to finally get all the chorus recordings together. Scott Snyder now has these tracks, and is beginning to assemble the final product. I've started the recording process for a studio version of Many Hearts, One Voice to be included on the album if there's room. I've started contacting all the conventions regarding the tracks they wanted included on the project, and working on collecting those songs. I'm shooting for a midyear 2003 release; but no promises yet. We're just beginning to look at the technical challenges of combining 10 different microphone schemes, 4 different recording formats, and nearly 650 voices onto one six minute segment of CD. Thank you for your patience, and continued support!! It's been quite a year. 10 conventions. Over 400 people. Over 600 voices. All coming together, binding our world and community. 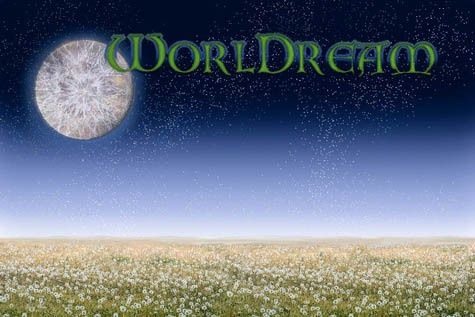 The WorlDream isn't a song. It isn't a recording (though we'll have that to remind us of the fulfillment of the Dream). It's a feeling. It's the knowing- that wherever you are, whatever you do; you belong to a global community. This started as my dream. For many of you, this became your dream as well. It has been a year of great tragedy and loss. We've had the horror and anger left by the attacks on 11 September. In addition to the losses from Ground Zero, we have lost a couple of our own as well. Alasdair Prett in the UK and Merce Crain in the US will not have the opportunity to hear their voices on the CD when it is released. My heart cries, and my soul mourns with their families and loved ones. It has been a year of growth and deepened personal connections; not only for myself; but for many others. A year of healing, as well. From the deepest parts of my heart and soul, I thank you for helping to bring this dream to reality. May the connections, bonds, and family that you have found through the year support and enrich you for the rest of your days. So- it really isn't over. It's only the beginning. This is NOT the year to miss a Filk Convention! I'm a filker. There are several pages and sites out there that describe filk, just do a search or follow my links to find more if you don't know what it is. Filk is my community. My neighbors, my friends, my family. I've been introduced to new family all over the world because of filk, the music it creates, and the fellowship it brings. So- for the new Millennium; I want to see all my friends and family. And there's only one way I know of doing that- by going to every filk convention that will be held next year. So, find out what the Dream is! Find which conventions are participating! Check out the song, and download the mp3! And I'll be seeing you sometime in 2001!